Incorporating Robert. J. Lilly, Douglas S. Kelley, Louis G. Leitgeb, Gertrude T. Rowe, and Bernadette Bresnahan and their associates and successors as an educational corporation under the corporate name of The Sand Lake Historical Society, to be located in the town of Sand Lake, county of Rensselaer, State of New York. The purpose for which such corporation is to be formed is to promote the appreciation and preservation or materials relating to the history and culture of the town of Sand Lake. The persons named as incorporators shall constitute the first board of ·trustees. The board shall have powers to adopt bylaws, including therein provisions fixing the method of election and the term of office of trustees, and shall have power also, by vote of two-thirds of all the members of the board of trustees to change the number of trustees to be not more than 25 nor less than 5. The corporation hereby created shall be a nonstock corporation organized and operated exclusively for educational purposes, and no part of its earnings or net income shall inure to the benefit of any individual, and no officer, member or employee of the corporation shall receive or be entitled to receive any pecuniary profit from the operations thereof, except reasonable compensation for services. The principal office of' the corporation is to be located in the Town of Sand Lake, county of Rensselaer, State of New York. The Commissioner of Education is designated as the representative of the corporation: upon whom process in any action or proceeding against it may be served. 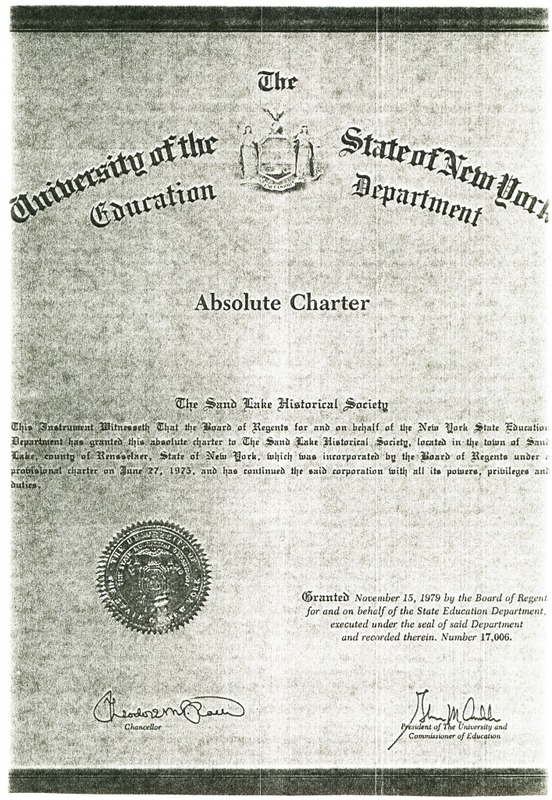 This provisional charter ·will be made absolute if, within 3 years, the corporation shall acqui.re resources and equipment available for its use and support and sufficient and suitable for its chartered purposes in the judgment of the Regents of The University, and be maintaining an institution of educational usefulness and character satisfactory to them. Prior to the expiration of said 3-year period, an application for the renewal of this provisional charter or for an absolute charter will be entertained by the Regents, but, in the event that such application is not made, then at the expiration of said term of 3 years, and upon notice by the Regents, this provisional charter shall terminate and become void and shall be surrendered to the Regents. Granted June 27, 1975 by the Board of Regents of The University of the State of New York and executed under the seal of said University and recorded as Number 15,065. This Instrument Witnesseth That the Board of Regents for and on behalf of the New York State Education Department has granted this absolute charter to The Sand Lake Historical Society, located in the town of Sand Lake, county of Rensselaer, State of New York, which was incorporated by the Board of Regents under a provisional charter on June 27, 1975, and has continued the said corporation with all its powers, privileges and duties. Granted November 15, 1979 by the Board of Regents for and on behalf of the State Education Department executed under the seal of said Department and recorded therein Number 17,006. Revised August 30, 2016 -- asm © 2019 Sand Lake Historical Society; all rights reserved.